In fact, the second one may even be “Near Cross”. At Rothwell Library, a helpful staff member pointed out the “new cross” on an old map, and mentioned how her family had lived near there. Perhaps this is the area of “New Cross”? I was looking for Cross Street which is still there, though most (if not all) of the old houses seem to have gone. Cross Terrace is also there – did the old houses on Cross Street look similar to these? 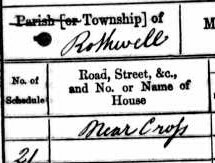 By 1891, both households had moved from Cross Street, to other streets in Rothwell that I failed to locate during the summer. 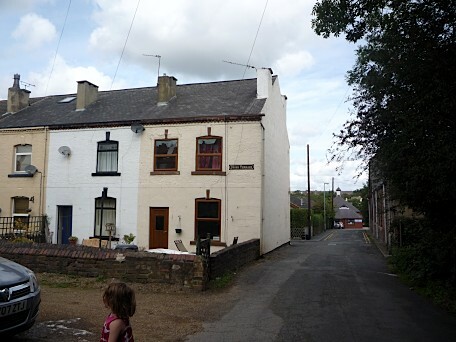 This week I discovered a fascinating document – Rothwell Conservation Area Appraisal and Management Plan – which details the town’s historic areas, one of which is Cross Terrace. Apparently all round that area is the “historic core” of Rothwell. There’s a whole heap of information about the history of the town and its architecture. On the Leeds City Council website, there are similar Conservation Area appraisals for other towns, including Oulton. The references at the end of each document are definitely worth a look, if you’re interested in the local history. “1861 England Census, Samuel Nunns (35) household, Rothwell, Yorkshire,” Ancestry.com, http://www.ancestry.co.uk/, accessed 30 Dec 2010, digital image, citing PRO RG9/3359, folio 6, page 5, GSU roll: 543120, Hunslet registration district, Rothwell sub-registration district, household 22, 07 April 1861. 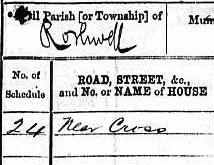 “1871 England Census, Samuel Nunns (44) household, Rothwell, Yorkshire,” Ancestry.com, http://www.ancestry.co.uk/, accessed 30 Dec 2006, digital image, citing PRO RG10/4517, folio 6, page 5, household 26, GSU roll: 848472, Hunslet registration district, Rothwell sub-registration district, 02 Apr 1871. “1881 England Census, Sarah Nunns (56) household, Rothwell, Yorkshire,” Ancestry.com, http://www.ancestry.co.uk/, accessed 05 Aug 2011, digital image, citing PRO RG11/4494, folio 5, page 3, GSU roll: 1342076, Hunslet registration district, Rothwell sub registration district, ED 1, 03 Apr 1881. “1881 England Census, Henry Nunns (29) household, Rothwell, Yorkshire,” Ancestry.com, http://www.ancestry.co.uk/, accessed 30 Dec 2006, digital image, citing PRO RG11/4494, folio 5, pp 4-5, GSU roll: 1342076, Hunslet registration district, Rothwell sub-registration district, ED 1, household 21, 03 Apr 1881. 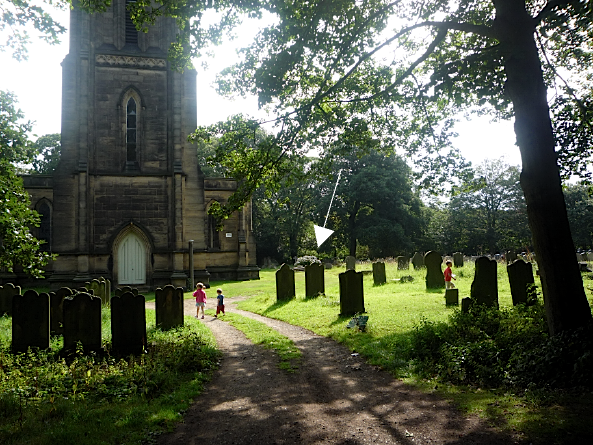 Whilst on our trip around West Yorkshire over the summer, my kids and I checked out St John the Evangelist church in Oulton, near Rothwell. 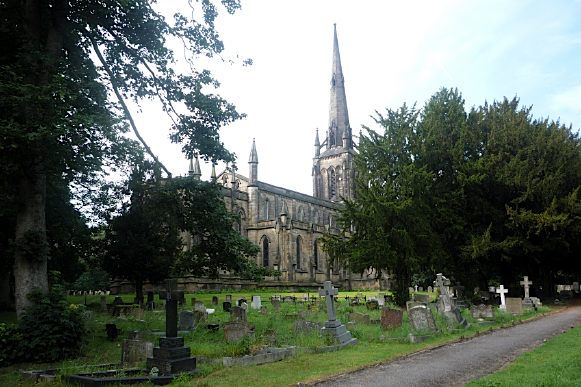 It’s a lovely looking church from the outside, and the graveyard is mostly well kept and fun to play hide and seek in. 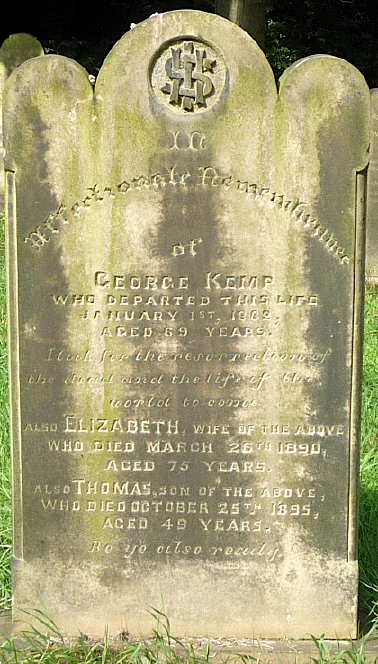 George and Elizabeth Kemp are my great great great great grandparents. Buried with them is their son, Thomas. I am descended from their daughter Sarah Ann. 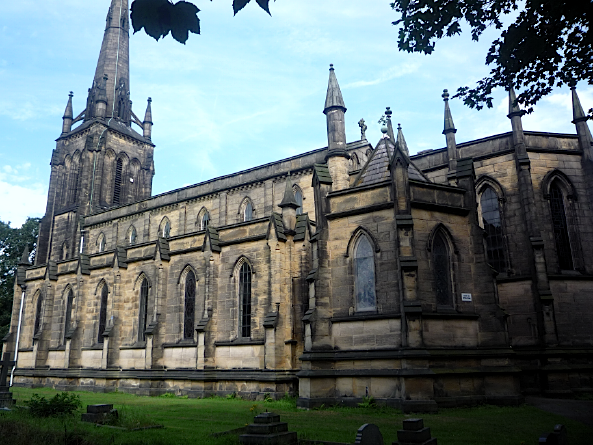 According to St John’s website, the churchyard is one of the biggest in Leeds, if not the county. 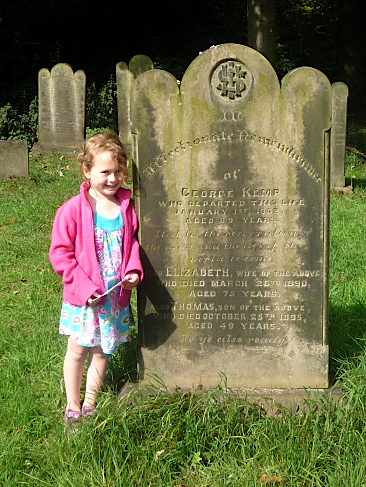 George and Elizabeth’s gravestone seems to be in a quite prominent spot, facing the church’s front door. My son also found some Cockerham graves and there were several other surnames from our family, but it will take a little digging (sorry, couldn’t resist!) to find out if they are part of our tree. West Yorkshire Archive Service, Wakefield, Yorkshire, England; Yorkshire Parish Records; Old Reference Number: D145/4; New Reference Number: WDP145/1/1/4, marriage of George Kemp and Elizabeth Dickinson, digital image; Ancestry.com, (http://www.ancestry.co.uk/, accessed 02 Sep 2011).